The Trust for Public Land continues our work to preserve the striking landscape of the Foothills that sit just beyond the Wenatchee city limits. In June 2012 we helped protect 285 acres that had been zoned for residential subdivision, protecting the viewshed and expanding both open space access and existing wildlife migration corridors. 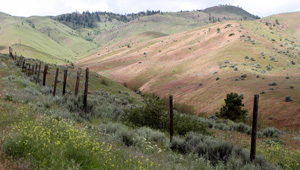 The Chelan-Douglas Land Trust holds an easement preventing development and plans for the area may include extending the existing trails through the property to connect with the popular Horse Lake Reserve recreation area.